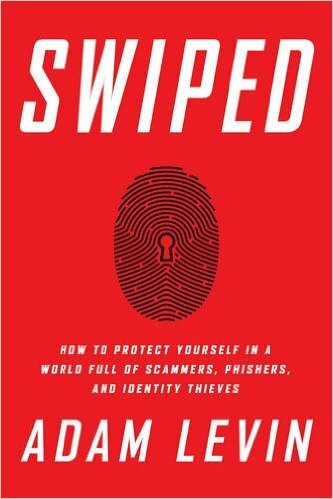 Author Adam Levin's new book, Swiped: How to Protect Yourself in a World Full of Scammers, Phishers, and Identity Thieves, addresses an unfortunate fact of life: identity theft here to stay. Passwords and aggressive spam folders are good but it's going to be difficult if not impossible to stop bad actors who steal identities for a living. Swiped tells the story of a nameless firm located in Russia with a trove of over a billion stolen internet passwords. Another group of fraudsters set up a website full of live streams of hacked web cameras, showing everything from people's offices and lobbies to the feeds from baby monitors. Even in-person purchases are logged by retailers like Target, which have fallen vulnerable to hackers. Levin, a longtime consumer advocate and identity fraud expert, has a knack for storytelling and highlighting relevant lessons. He also offers a strategy for dealing with these risks: don't wait until it happens to take action. Levin outlines three M's: minimizing risk, monitoring your identity and managing the damage. Insomuch, this easy to read, compelling book offers invaluable advice not only for preventing problems but helping cope when they arrive.